Arnie Gundersen: Lethal Levels of Radiation at Fukushima: What Are the Implications? In the latest video on Fukushima (8/4/2011), Arnie Gundersen of Fairewinds Associates thinks 10-plus sieverts/hour radiation at the base of the exhaust duct is from cesium that has been released from the Containment Vessel of Reactor 1, condensed and accumulated at the bottom over time. I don't necessarily agree with his hypothesis, but that's not what I was surprised when I saw the video. He says that the highly radioactive debris have been "bulldozed under", and when the debris are unearthed in the future we will see more high radiation spots. I don't remember reading the news that the radioactive debris at the plant were ever actually buried. I remember one person who did say "Dig a hole, bury the debris so that the workers can work", Michio Ishikawa of the Japan Nuclear Technology Institute, a strong proponent of nuclear power who expressed a very pessimistic view of the TEPCO/government response to the Fukushima nuclear accident in late April. Ishikawa also said the core had melted down and probably out of the RPV. That was officially admitted 2 weeks later. He also said a bridgehead must be built do the reactor, and forget about the turbine building. That also happened. Workers entered the reactor buildings, and they installed the heat exchangers for the Spent Fuel Pools (Reactors 2, 3, 4, and Reactor 1's heat exchanger has just been installed). Is it possible that Ishikawa's suggestion on radioactive debris was also carried out? Or Is Gundersen simply mistaken? Or does he have some insider source? Lethal Levels of Radiation at Fukushima: What Are the Implications? from Fairewinds Associates on Vimeo. #Radiation in Japan: Chernobyl-Affected Trees from Europe Sold in Japan? Ignorance can be deadly. Literally. "I want to tell you how some European countries have been disposing the trees that were contaminated by the fallout from the Chernobyl nuclear accident 25 years ago. Japanese timber trading companies started to buy Norway Spruce [Picea abies, also commonly called European Spruce]- "whitewood" - from Germany, Finland, and Sweden in great quantities, and the import continues to this day. "Compared to Japanese Cedar, Norway Spruce has less knots, whiter color-tone, and best of all it is cheaper than Japanese Ceder. It has been very popular with the Japanese homebuilders and sold in large quantities at home centers. We don't see the timber from Germany any more these days, maybe they finished cutting down all the affected trees. Red Pine from Russia is still used as rafters for the apartment buildings. "In other words, [these countries] have successfully disposed the trees contaminated with radiation by sending them to a far away country [Japan]. And we didn't know it in Japan. Our ignorance is the problem." This is the email I just received from a charcoal producer. Isn't it amazing? Amazing is an understatement. I don't know whether Japan has been their exclusive export market for the affected trees or not. Probably not. I also don't know whether the level of radioactive materials in the wood is anything significant. But from the charcoal producer's email, the heavy import of the timber from these countries started at a particular point in time, 1991. The Japanese government was quite anxious to suppress any negative attitude toward nuclear energy among the populace after the Chernobyl accident, and embarked on the PR campaign selling the safety of nuclear energy. It was very successful in doing so. Many people in Japan may have heard about Chernobyl when the accident happened, but were totally unaware of the radiation contamination that spread far and wide. The accident was in some remote area in the Soviet Union and didn't affect Japan in any significant way, they thought. For example, in 1991 (what a coincidence), the government, through the Science and Technology Agency (now part of Ministry of Education and Science), created an instruction manual on how to counter the Chernobyl accident and further promote nuclear power among Japanese (the link is in Japanese), who may have become skeptical of nuclear energy after the accident. The manual details the specific approaches for specific target groups - housewives, fathers, school children, media, etc. If this timber import to Japan from the affected areas in Europe is true, it could well be under the "guidance" from the Japanese government. "Let's help out these countries, and we get the cheap lumber. Radiation? It's so minute it won't affect health. Just don't tell people." Something like that, maybe. Just substitute "countries" with "prefectures", "lumber" with "vegetables, meat, fish", then you may see that's more or less what the Japanese government has been doing since March 11. Dr. Mori was one of the very first researchers to raise the danger of radioactive strontium in the soil, early on in the Fukushima nuke accident. This has got to be the biggest "Extend and Pretend" stunt so far by the power that be in Japan. Everything's under control. Fukushima I Nuke Plant is stable. TEPCO has submitted the plan for emergency cooling systems, which was immediately approved by the Nuclear and Industrial Safety Agency the very next day. Everything's fine. The Japanese government wants to have the residents within the 3-kilometer radius from Fukushima I Nuke Plant to return temporarily. Which towns fall within the 3-kilometer radius? Okuma-machi and Futaba-machi where Fukushima I is located. Okuma-machi is is also where plutonium was found in the soil back in April. Goshi Hosono, minister in charge of nuclear plant accident [and assistant to the prime minister], indicated that the government will start planning for a temporary return of the residents within the 3-kilometer radius from Fukushima I Nuclear Power Plant. He spoke with the press after he met with Fukushima Governor Yuhei Sato in Fukushima City. Mr. Hosono said, "Safety is the most important, but we're now reaching the point where we need to seriously discuss the possibility (of returning the residents in the 3-kilometer radius temporarily)." However, he said the radiation level around the power plant was still high, and continued, "A cautious approach is called for. We will need to decide on the procedure and the timing." We're now reaching the point?? Now that the radiation levels inside Fukushima I Nuke Plant are expressed in "SIEVERTS", we're reaching the point where the residents closest to the plant can return? It was awful 66 years ago. It is awful 66 years later. Goodbye nuke, goodbye TEPCO. Aren't we reaching the point of saying "Goodbye government"? S&P decided the deal on the budget deficit was not good enough for them and downgraded the long-term US sovereign credit rating from the top rating of AAA to AA-plus, with long-term outlook negative, and short term rating of A-1+ (the same as before). This is the first time ever that a major credit rating agency downgraded the US sovereign debt. The other two rating agencies, Moody's and Fitch, haven't made the move to downgrade the US debt. Mercifully (I guess but who knows? ), the announcement was outside the hours of financial markets around the world on Friday evening. * We have lowered our long-term sovereign credit rating on the United States of America to 'AA+' from 'AAA' and affirmed the 'A-1+' short-term rating. * We have also removed both the short- and long-term ratings from CreditWatch negative. * The downgrade reflects our opinion that the fiscal consolidation plan that Congress and the Administration recently agreed to falls short of what, in our view, would be necessary to stabilize the government's medium-term debt dynamics. * More broadly, the downgrade reflects our view that the effectiveness, stability, and predictability of American policymaking and political institutions have weakened at a time of ongoing fiscal and economic challenges to a degree more than we envisioned when we assigned a negative outlook to the rating on April 18, 2011. * Since then, we have changed our view of the difficulties in bridging the gulf between the political parties over fiscal policy, which makes us pessimistic about the capacity of Congress and the Administration to be able to leverage their agreement this week into a broader fiscal consolidation plan that stabilizes the government's debt dynamics any time soon. * The outlook on the long-term rating is negative. We could lower the long-term rating to 'AA' within the next two years if we see that less reduction in spending than agreed to, higher interest rates, or new fiscal pressures during the period result in a higher general government debt trajectory than we currently assume in our base case. said today that it lowered its long-term sovereign credit rating on the United States of America to 'AA+' from 'AAA'. Standard & Poor's also said that the outlook on the long-term rating is negative. At the same time, Standard & Poor's affirmed its 'A-1+' short-term rating on the U.S. In addition, Standard & Poor's removed both ratings from CreditWatch, where they were placed on July 14, 2011, with negative implications. The transfer and convertibility (T&C) assessment of the U.S.--our assessment of the likelihood of official interference in the ability of U.S.-based public- and private-sector issuers to secure foreign exchange for debt service--remains 'AAA'. Our lowering of the rating was prompted by our view on the rising public debt burden and our perception of greater policymaking uncertainty, consistent with our criteria (see "Sovereign Government Rating Methodology and Assumptions," June 30, 2011, especially Paragraphs 36-41). Nevertheless, we view the U.S. federal government's other economic, external, and monetary credit attributes, which form the basis for the sovereign rating, as broadly unchanged. We have taken the ratings off CreditWatch because the Aug. 2 passage of the Budget Control Act Amendment of 2011 has removed any perceived immediate threat of payment default posed by delays to raising the government's debt ceiling. In ddition, we believe that the act provides sufficient clarity to allow us to evaluate the likely course of U.S. fiscal policy for the next few years. dropped down on the menu of policy options. In addition, the plan envisions only minor policy changes on Medicare and little change in other entitlements, the containment of which we and most other independent observers regard as key to long-term fiscal sustainability. hand (see "Global Aging 2011: In The U.S., Going Gray Will Likely Cost Even More Green, Now," June 21, 2011). Standard & Poor's takes no position on the mix of spending and revenue measures that Congress and the Administration might conclude is appropriate for putting the U.S.'s finances on a sustainable footing. The act calls for as much as $2.4 trillion of reductions in expenditure growth over the 10 years through 2021. These cuts will be implemented in two steps: the $917 billion agreed to initially, followed by an additional $1.5 trillion that the newly formed Congressional Joint Select Committee on Deficit Reduction is supposed to recommend by November 2011. The act contains no measures to raise taxes or otherwise enhance revenues, though the committee could recommend them. The act further provides that if Congress does not enact the committee's recommendations, cuts of $1.2 trillion will be implemented over the same time period. The reductions would mainly affect outlays for civilian discretionary spending, defense, and Medicare. We understand that this fall-back mechanism is designed to encourage Congress to embrace a more balanced mix of expenditure savings, as the committee might recommend. We note that in a letter to Congress on Aug. 1, 2011, the Congressional Budget Office (CBO) estimated total budgetary savings under the act to be at least $2.1 trillion over the next 10 years relative to its baseline assumptions. In updating our own fiscal projections, with certain modifications outlined below, we have relied on the CBO's latest "Alternate Fiscal Scenario" of June 2011, updated to include the CBO assumptions contained in its Aug. 1 letter to Congress. In general, the CBO's "Alternate Fiscal Scenario" assumes a continuation of recent Congressional action overriding existing law. rating and a negative outlook--we now project that net general government debt would rise from an estimated 74% of GDP by the end of 2011 to 79% in 2015 and 85% by 2021. Even the projected 2015 ratio of sovereign indebtedness is high in relation to those of peer credits and, as noted, would continue to rise under the act's revised policy settings. Our revised upside scenario--which, other things being equal, we view as consistent with the outlook on the 'AA+' long-term rating being revised to stable--retains these same macroeconomic assumptions. In addition, it incorporates $950 billion of new revenues on the assumption that the 2001 and 2003 tax cuts for high earners lapse from 2013 onwards, as the Administration is advocating. In this scenario, we project that the net general government debt would rise from an estimated 74% of GDP by the end of 2011 to 77% in 2015 and to 78% by 2021.
net public debt burden would rise from 74% of GDP in 2011 to 90% in 2015 and to 101% by 2021.
financial crises in which the slow process of debt deleveraging in the private sector leads to a persistent drag on demand. As a result, our downside case scenario assumes relatively modest real trend GDP growth of 2.5% and inflation of near 1.5% annually going forward. When comparing the U.S. to sovereigns with 'AAA' long-term ratings that we view as relevant peers--Canada, France, Germany, and the U.K.--we also observe, based on our base case scenarios for each, that the trajectory of the U.S.'s net public debt is diverging from the others. Including the U.S., we estimate that these five sovereigns will have net general government debt to GDP ratios this year ranging from 34% (Canada) to 80% (the U.K.), with the U.S. debt burden at 74%. By 2015, we project that their net public debt to GDP ratios will range between 30% (lowest, Canada) and 83% (highest, France), with the U.S. debt burden at 79%. However, in contrast with the U.S., we project that the net public debt burdens of these other sovereigns will begin to decline, either before or by 2015. T&C assessment reflects our view of the likelihood of the sovereign restricting other public and private issuers' access to foreign exchange needed to meet debt service. Although in our view the credit standing of the U.S. government has deteriorated modestly, we see little indication that official interference of this kind is entering onto the policy agenda of either Congress or the Administration. Consequently, we continue to view thisrisk as being highly remote. The outlook on the long-term rating is negative. As our downside alternate fiscal scenario illustrates, a higher public debt trajectory than we currently assume could lead us to lower the long-term rating again. On the other hand, as our upside scenario highlights, if the recommendations of the Congressional Joint Select Committee on Deficit Reduction--independently or coupled with other initiatives, such as the lapsing of the 2001 and 2003 tax cuts for high earners--lead to fiscal consolidation measures beyond the minimum mandated, and we believe they are likely to slow the deterioration of the government's debt dynamics, the long-term rating could stabilize at 'AA+'. On Monday, we will issue separate releases concerning affected ratings in the funds, government-related entities, financial institutions, insurance, public finance, and structured finance sectors. Professor Tatsuhiko Kodama of Tokyo University, whose fiery remark at the Health and Labor committee in the Lower House of Japan's Diet has inspired many people in Japan and in the world, spoke with independent journalist Daisuke Tsuda in his office at the university on August 5. The interview was set up by Shukan Gendai, a popular weekly magazine in Japan with extensive coverage of the Fukushima nuclear accident and the resultant radiation contamination throughout Japan. Professor Kodama, in person, is very much relaxed and soft-spoken, as you can see in the video at the end of the post. Self-deprecating, and a patient teacher, from the way he describes the radiation issues as he sees them. Part 1 of the summary below covers the first 10 minutes or so of the highly informational interview, which lasted for 66 minutes. It is is not the literal translation. I will post the rest as I finish. The first quick pass, and subject to later revision (when I notice egregious mistakes). "I was surprised at the strong reaction people seem to have had to my speech. I'm called as witness to the committee often, usually about food safety or children's playground safety. I didn't think much of it on that day. But then my son told me "Something strange is happening." Many people sent me emails, twitter, facebook messages, with encouragements, concerns and criticisms. I am very grateful for the feedback. "In an academic world, we make progress when different people contribute from different angles. But suddenly it feels like I'm caught up in a big turbulence. Some of you may have mistaken me as a "good person" (laugh) but I'm just a regular person. My friends say my "freshness date" is about 2 weeks (laugh). They say I have about a week left to say what I want." "Scientists talk based on certain assumptions. But when the assumptions are wrong, then everything based on those assumptions is wrong. "A good example is the standard for radiation safety. To assess the radiation safety we use "microsieverts". Such and such microsieverts/hr is detected, so it's safe/dangerous, and the argument goes on for ever over the number. But what we have now cannot be understood by this number alone. The 5 microsieverts/hour radiation detected [on March 15 in Ibaraki]. What's more significant than this high number is that it was detected 100 kilometers from the plant. An enormous amount of radiation was released. The average may be 5 microsieverts/hr, but in one spot it could be 500 microsieverts/hr, in another 0.5 microsievert/hr. That's how I see the problem. "Ministry of Education and Science decided on the radiation level for children based on the time they spend in schools. But children are exposed to radiation in their homes. The radiation level for food was decided, as if there were a few food items that were radioactive. But we may have radioactive materials in almost all food. Unexpected concentration of radioactive materials may happen. The fundamental nature of the problem has changed. But mainstream scientists and the government don't seem to notice the change, and continue to apply the old standard of radiation protection, which is to take care of a radiation "spot". Now, what we have is two dimensional or three dimensional space filled with radiation. "Also, at our Radioisotope Center, we treat different isotopes differently. But when you talk radiation in "microsieverts", you bundle everything together, as if different radionuclides were the same. As I said in the committee, thorotrast goes to liver. Iodine goes to thyroid, and cesium goes to urinary bladder. There is no point in considering them together." TEPCO announced on August 5 that 700 liters of highly contaminated water was found leaking from the hose inside the Central Waste Processing Facility at Fukushima I Nuclear power Plant. There was no effect on the environment outside the building. TEPCO hadn't tested the density of the contaminated water [at that location?] until the leak was found. It again raises the question of the effectiveness of TEPCO's safety measures. According to TEPCO, the leak was found at the hose that routes the water used to flush the vessels [Kurion's system] back into the treatment system. Cesium-134 was detected at 5,500,000 becquerels/cubic centimeter, and cesium-137 was found at 6,270,000 becquerels/cubic centimeter. The level of cesium is about the same as that of the contaminated water in the basements of the turbine buildings at Reactors 3 and 4. What? That's the level of contamination in the water in Reactors 3 and 4? That's news to me also. Water in the basements of Reactors 1 and 2 is considered even more radioactive. Now, the city's Board of Education finally admits that the city may have fed as many as 67,000 kids in elementary schools in the city with radioactive beef. Yokohama City announced on August 5 that the meat from 19 cows in Fukushima, Miyagi, and Iwate that may have been fed with rice hay contaminated with radioactive cesium may have been used in school lunches at the city's 127 elementary schools (for about 67,000 pupils). According to the Health and Education section of the city's Board of Education, the meat from 19 cows were used 12 times between April 19 and June 21 as the ingredient for school lunches. The testing for radioactive materials in the meat was never done, and the meat has probably been all consumed. The Health and Education section of the Board of Education says "We don't know if we can trace the meat at all." 25 to 40 grams of the meat was used per serving. The Board of Education says "Since it was a small amount, it's hard to believe it would affect the health." Here we go again. Citizens of Yokohama, take down the names of the people who said this. So, the concerned citizens in Yokohama was raising the issue since April, and the they were dead right. They raised the issue with the city, and the city refused to do anything. Why? They could have tested the meat in April, and could have stopped using it. Instead, they did nothing, forced kids to eat school lunches (many parents were upset with school principals refusing to allow home-made lunch). Too afraid to find out? Too cheap to test? Needless to say, it is not just elementary schools. That's what the city officials have admitted to. School lunches for kindergartens and nursery schools, and for junior high schools, are also prepared in the city's facilities and distributed to these schools. Schools are planning to have children do the yard cleanup after the summer break. Parents, pull your children out of schools. Any school. The announcement from the city's Board of Education is here (in Japanese). It details which school ate what on which date from which cow (with ID number). If you are a parent in Yokohama and read Japanese, go to the link above and check what your child may have been fed. So far, there has been no report of detection of the radioactive materials exceeding the provisional safety limit. Of course there isn't, because all the meat has been consumed and there's nothing left to test. And obligatory reference to "Oh the radiation level from the beef is the same as one chest X-ray so it's no big deal." It's really scary that these people are "educators". We know better, don't we, thanks in part to people like Professor Kodama (I've started the summary of his interview on August 5), who tells us that the number is irrelevant when assessing the risk of radiation; it's where the radionuclides go in the body and what specific effect they have at particular locations. Watching Professor Kodama. He's explaining that chronic low-level radiation may cause chronic inflammation that leads to cancer. He is very soft spoken in person. Warm smiles. He explains scientific/technical issues for lay people well. "What we need now is forecast, simulation, not academic studies. We need to protect mothers and children first." "Do what we each can, instead of argument for the sake of argument. Contribute by doing what you can do best. It doesn't need to be about nuclear power or radiation. Play with children if you are good at playing with children. Even if that doesn't directly related to solving radiation problem or contamination problem, in a roundabout way I'm sure it will lead to a better solution." Or something like that... So I will do what I'm good at these past 4 months; I will view the entire recorded video tomorrow and report back to you to share my findings. Another solid "sievert" number from Fukushima I Nuclear Power Plant. Maybe I shouldn't be writing in sieverts. It minimizes the significance somewhat. It is 3.6 sieverts/hour, or 3,600 millisieverts/hour, or 3,600,000 microsieverts/hour. No humans of any age should be exposed to that kind of radiation, not even the TEPCO workers. Investigating the 10-plus sieverts/hour radiation at the bottom of the main exhaust duct for the Reactors 1 and 2 at Fukushima I Nuclear Power Plant, TEPCO announced on August 4 that 3.6 sieverts/hour radiation was detected at the drain pipe that connects to the bottom of the main exhaust stack for Reactors 1 and 2. The pipe is for draining rainwater from the bottom of the exhaust stack. 3.6 sieverts/hour radiation was measured at several meters from the exhaust stack. TEPCO has designated the area around the pipe as off-limits. The 3.6 sieverts/hour spot was found by 4 workers measuring the area as part of investigation to find out why the radiation at the exhaust stack had such high radiation exceeding 10 sieverts/hour. The maximum radiation exposure for the workers was 2 to 3 millisieverts. I have to wonder where the rainwater has been draining, all these 4-plus months. Shukan Gendai, a Japanese weekly magazine with excellent original reporting on the Fukushima disaster, is hosting an interview of Professor Tatsuhiko Kodama of Tokyo University with journalist Daisuke Tsuda, who has been visiting and reporting on the disaster affected areas in Tohoku. The talk, according to Shukan Gendai, will focus on what Professor Kodama couldn't cover in the testimony in the Diet committee, radiation contamination, and what needs to be done now. From Yahoo Finance screen as of 12:40PM PST 8/4/2011. Less than 20 minutes to go till the stock market closes. Some support at 11,000, a bit more solid support at 10,000. Will the Fed come to the rescue? Less than 10 minutes to go now, and it's down 513. #Fukushima I Nuke Plant: 2 Sieverts/Hr on Water Surface in the Reactor Bldg Basement?? That's what a worker at Fukushima I Nuclear Power Plant tweeted on August 4. He was expressing his concern for the radiation if the contaminated water in the basements of the reactor buildings becomes less, as TEPCO plans, because of the water treatment system. TEPCO says that their plan to treat all the highly contaminated water at the plant is more or less intact; if not by the end of the year as planned, at least by the end of February next year. This worker is worried that if that means lower or no water in the basement, the basement could become so radioactive; he thinks the melted fuel is in the basement. I don't know for sure which basement he is specifically referring to, but from his past tweets it could be Reactor 1 where he's been working to install the heat exchanger for the Spent Fuel Pool. It could be an outrageous level of radiation... I don't think they can empty the basement... Personally I think the melted-through fuel dropped through the ICM [In Core Monitor?] pipe or RPV drain to the bottom of [or below?] the pedestal, but no way of knowing how much of the fuel is there unless you go there and look. Well, if a worker at the plant like me worries about it, I'm sure TEPCO and the government have already thought about it and come up with the solution. But that's my concern. I've seen a smaller number (14 centimeters) for the half value layer of water. I don't remember that the surface radiation level of the basement water was ever released by TEPCO. If anyone is aware, please let me know with the link. Reactor 1 is where the 4 sievert/hour steam was seen gushing through the floor of the reactor building in early June. So, if the radiation on the water surface is 2 sieverts/hour, that's an improvement, I guess. In the so-called "hot spots" in Fukushima Prefecture and the rest of Tohoku and Kanto, we're still talking in "microsievert/hour". At Fukushima I Nuke Plant, the "hot spots" are now in "sievert/hour". Remember the good old days when anything exceeding 100 millisievert/hour was considered extremely high at the plant? Just the "new normal" in Japan, and life goes on, apparently. Minister of Education and Science Yoshiaki Takagi, a former union official at a shipyard in Nagasaki before he ran for office, visited Monju, the troubled fast breeder reactor in Tsuruga City in Fukui Prefecture where Governor Nishikawa may be jockeying for an advantageous position vis a vis the national government on the Hokuriku Shinkansen (bullet train) project and opposing the re-start of the reactors in his prefecture. Minister of Education and Science Yoshiaki Takagi visited Fast Breeder Reactor "Monju" in Tsuruga City, Fukui Prefecture to be briefed on the implementation of safety measures after the Fukushima I Nuclear Power Plant accident. After the visit, the minister gave comments to the press, "Research and development to find ways to use uranium fuel more effectively and to reduce nuclear waste is a natural fit for Japan, which has scarce natural resources", emphasizing the importance of developing a fast breeder reactor. However, he avoided specifics of the future development policy and said "it will be made clear through the discussion of renewable energy in the government's energy and environmental committees". Minister Takagi hinted at discontinuing the development of Monju during the press conference after the cabinet meeting on July 15 morning, but effectively withdrew his comment in the evening of the same day. Since Sellafield is closing its MOX-fuel plant specifically designed for the Japanese nuclear industry due to uncertain prospect after the Fukushima accident, Monju will be needed more than ever, if it ever succeeds in running for more than a few weeks. Or the new generation of fast breeder reactor, to be built by Mitsubishi FBR Systems, which was set up by Mitsubishi Heavy Industries in 2007. Mitsubishi Heavy Industries was selected by the government (Ministry of Education and Science, Ministry of Economy, Trade and Industries) and the Federation of Electric Power Companies as the core company to develop the next generation fast breeder reactor in 2006. There is no "free market" for the nuclear industry. The Japanese government seems to be "instructing" TEPCO not to release certain information in English. TEPCO submitted the report to its regulatory agency Nuclear and Industrial Safety Agency (NISA) "on the measures to continue water injection into reactors of Units 1 to 3 at Fukushima Daiichi Nuclear Power Station" on August 3. It's in Japanese only, and it may or may not be translated into English. We have provided a Japanese press release version of the instruction document received from NISA. However, at this time we have reserved the right not to provide an English version due to potential misunderstandings that may arise from an inaccurate rendering of the original Japanese text. We may provide the English translation that NISA releases in our press releases. However, in principle we would advise you to visit the NISA website for timely and accurate information. The 34-page Japanese report is here. It is an excellent report in "Extend and Pretend", full of elaborate diagrams and flow charts, which states that TEPCO will be able to resume water injection into the 3 (broken) reactors at Fukushima I Nuke Plant within 3 hours at most, more likely within 30 minutes, in case of an emergency which causes the water to stop for any reason - pump failure, power outage, even the total station blackout. It almost makes me wonder that the reason for not providing English translation is not to avoid "potential misunderstanding" but out of embarrassment. It states that zirconium will start to interact with water at a certain temperature (1,200 degrees Celsius). Most likely, there is no fuel left inside the RPVs at Fukushima I Nuke Plant. Even if there is, it is not fuel any more but "corium" - fuel, control rods, instruments, whatever inside the RPV, melted together. TEPCO has already admitted that there are holes in the RPV, and holes in the Containment Vessels. There is no zirconium left because there is no cladding left. In fact, nowhere in the report does the company say anything about melted fuel, broken reactors, water in the basements, or extremely high radiation at certain locations in the plant. But the report goes on to describe the elaborate backup pump system and power system as if what they are dealing with is normal (i.e. without cracks or holes at the bottom) reactors with intact fuel rods inside the RPVs with control rods safely deployed in a clean nuclear power plant, and all they need to worry is how they can continue the cooling; or as if the salt-encrusted molten mess of everything that was inside the RPV behaves just the same as normal fuel rods in a normal reactor. One of the first responses required in almost all emergency cases described in the report requires the plant personnel hurrying to the parking lot on the ocean-side of the main administrative building to carry out the necessary task. What if it's again the earthquake/tsunami situation where the plant workers cannot come to the parking lot? Any contingency plan for that? Why was TEPCO asked by NISA to submit this report to begin with? So that the national government can begin the discussion with the local municipalities within the 20-kilometer radius evacuation zone for the return of the residents to their towns and villages. The discussion is to begin this month, and TEPCO's report will be used to reassure the residents that Fukushima I Nuke Plant is so stable now with the solid plans (to be approved by NISA, which no doubt will happen very soon) to cool the fuels in the reactors even in case of an emergency. Remember the mayor of Naraha-machi, where Fukushima II Nuclear Power Plant is located? He wants TEPCO to restart the plant so that 5,000 jobs will return to the town. He also wanted to invite the government to build the final processing plant of spent nuclear fuels in his town. He would be the first one to highly approve of the report so that his town can continue to prosper with nuclear money. As Haruki "Detarame" Madarame said so well, "It's all about money, isn't it?" Is it even an issue at this point? There was absolutely no information in March and April warning against radioactive fallout in the countryside in Fukushima, where many residents ate the wild mountain vegetables - seasonal delicacy. On the contrary, as we all know now throughout the world (I hope), the national government and the Fukushima prefectural government were busily dispatching the two Nagasaki University professors (Yamashita and Takayama) to brainwash the residents. Now the Fukushima prefectural government says it will test wild mushrooms. About the only reason I can think of is that the prefectural government just wants to make sure they are contaminated beyond 500 becquerels/kg level, so that they can send the bill to TEPCO for non-sales. If they are contaminated but with less than 500 becquerels/kg level and people still don't buy the mushrooms, they will send the bill to TEPCO anyway for damages from "baseless rumor", also known as "radiation". The testing probably has nothing to do with safety for the consumers. Remember, they, and everyone in the government or with strong ties with the government have been saying all along that if you eat food that contains radioactive cesium well exceeding 500 becquerels/kg, it is safe. Fukushima Prefecture announced on August 3 that it will test wild mushrooms in Fukushima for radioactive materials. The harvest season for wild mushrooms will start soon. The testing will start within this week. According to the prefecture's Agriculture, Forestry and Fisheries Division, the testing will done on 45 types of mushrooms sold at shops within the prefecture including direct sales depots. If radioactive materials exceeding the provisional safety limit are found in a mushroom, the prefectural government will ask the municipality where the mushroom was harvested to voluntarily stop the shipment of the same mushrooms. Still no information as to what caused the hothouse mushrooms to become radioactive. As ultra-hot spots exceeding 5 sieverts/hour are being discovered Fukushima I Nuclear Power Plant and as the situation of serious radiation contamination is finally starting to sink in, what do they do in Fukushima Prefecture? Hold the annual high school cultural festival, gathering high school students from all over Japan to Fukushima, in cities where high-radiation hot spots have been discovered throughout, or highly radioactive rice hay/meat cow has been found, or both. In one of the cities, Fukushima City, cobalt-60 has been detected in the soil in a park. Business as usual, extend and pretend that everything is back to normal. Radiation? What radiation? The event is organized by the Agency for Cultural Affairs and the Boards of Education in each city in Fukushima, both under the Ministry of Education and Science. The 35th Annual All Japan High School Cultural Festival in Fukushima 2011 started as scheduled on August 3. The event is organized by the Agency for Cultural Affairs and others and sponsored by companies including Asahi Shinbun. There was a doubt as to whether the event would be held because of the Fukushima nuclear plant accident, but now 12,600 high school students from all over the country come to Fukushima, and will compete in 15 events that include chorus, art and craft, game of "go", Japanese chess. The Festival is dubbed as "intercollegiate for high-school cultural clubs". The organizing committee of students and teachers have been preparing for the Festival for over a year. Initially, 23 events were planned that 20,000 students would participate in. But after the March 11 earthquake/tsunami some of the event venues became the evacuation shelters, and there was a concern for the radiation level in the areas where the events would be held. As the result, some events have been canceled, or the venues have been changed to other locations. The grand opening ceremony will be held in Aizu Wakamatsu City on August 4. 550 local high school students will participate in a play that will express their hope for the recovery of Fukushima. The Festival is supported by 3,200 high school students in Fukushima Prefecture who serve as the operating personnel for the organizing committee. They act as guides at the airport and at the major train stations, as well as helping set up the event venues, provide tea service, flower arrangements at the train stations and at the event venues. At the Fukushima Airport, 4 students from Sukagawa High School greeted the plane flown in from Osaka. They had prepared themselves well with hypothetical questions and answers. They guided the participants from Hyogo Prefecture through the airport, explained how to get to the event venues. They sent off the Hyogo students with "We hope you'll do your best." At JR Koriyama Station, two girls from Asaka Kaisei High School were waiting for the participants. One girl said, "So many people are coming from far away places to Fukushima, where much damage has been sustained. I'm nervous, but I will greet them with a smile." Visiting for a few days in a high-radiation area is different from living in such an area, you would say. So? There was a piece of news back in May which was very quickly buried. The news said that thousands of people received elevated radiation just by being in Fukushima Prefecture for a few days. The organization "Safe Children of Fukushima" put up a Facebook page telling the high school students of the risk of radiation, and specific steps what they should do which include not going to Fukushima. The organization tells the students, "If you do go, take protective measures against radiation, and talk about the radiation risks with the students in Fukushima." It has a map showing the radiation measurement along the railway line - approaching Koriyama City and Fukushima City, the level goes up to that of radiation control areas in nuclear facilities. No matter. The governor of Fukushima, Yuhei Sato, as the honorary chairman of the organizing committee, would never think of depriving Fukushima high school students of their once-in-a-lifetime opportunity of hosting this prestigious cultural event. And why should he? He clearly doesn't even care for kindergarteners in Fukushima, as it turns out he was probably the one who wanted 20 millisieverts/year radiation limit for school children. Someone posted the video (zip file from TEPCO that I linked yesterday) on Youtube. Thank you. The Packbot crawls toward the "train room" (for emergency gas treatment system), as 9 carbon-based colleagues watch from behind. The robot "Packbot" went to the opening to the "train room" and the survey meter went overscale. The actual radiation level at the opening could be a lot higher, and I hate to think how high it is INSIDE the room. The radiation could have fried the bot. Notice how rapidly the radiation level rose, from 18 to 300 to 2000 to over 5000, as the robot went inside the air conditioning room to the entrance of the "train room"
TEPCO also has the video of the operation, here (it's a zip file). Another Tokyo University Professor Haruki "Detarame" Madarame Tells Like It Really Is: "It's All About Money, Isn't It?" The current chair of the Japan's Nuclear Safety Commission is Haruki Madarame, who's been dubbed "Detarame" Haruki in Japan, or "Falsehood, nonsense" Haruki. "Detarame" nicely rhymes with his last name. He was a professor at Tokyo University before he became the chair of the NSC in April 2010. He gave an interview to a citizens' group back in 2005 on nuclear energy. Far from being "falsehood" or "nonsense", his talk was very frank, and totally made sense. It's all about money - if someone's unwilling to have a nuclear waste dump in his backyard, tell him you'll pay him twice the amount promised before. If he still says no, tell him you'll pay him 5 times as much, or 10 times as much. Somewhere down the line, someone will say yes, and that's all that matters. And Madarame saw nothing wrong with that. In fact, he didn't see anything wrong with any of his positions, because that was how it was. Too bad it had to take the Fukushima nuke accident for the average Japanese to realize not only they'd been served with imperfect and dangerous "clean energy" technology but also that a nuclear expert like Madarame at the nation's top research institute knew quite well about the danger and the nature of the nuclear technology and industry and was openly telling people about it. Laughing, as if it was a funny joke. Quite a contrast to another Tokyo University professor, Tatsuhiko Kodama, who seems to have inspired many people beyond Japan's border. Madarame also said in the interview, "Trust us." And trust we did. The photo was uploaded on August 2 on Twitpic. The person who took the picture tweeted to one of the independent journalists covering the Fukushima accident as "People from all over Asia are protesting in front of TEPCO's head office right now. Are you aware of that?" Now that the Ministry of Agriculture has set the provisional safety standard for compost at 400 becquerels/kg, this is the first manure to exceed that limit. It was made in Ibaraki Prefecture, and was being sold in Kyoto. Low-level contamination spreads to the western half of Japan. Already, radioactive leaf compost have been found in Tottori Prefecture (Chugoku region) and Kagawa Prefecture (Shikoku region). The Kyoto prefectural government announced on August 2 that 4,990 becquerels/kg of radioactive cesium was detected from the manure labeled "made in Ibaraki Prefecture"; the level of radiation is more than 10 times the provisional safety limit of 400 becquerels/kg. The manure was sold at "Royal Home Center Mozume Branch" in Muko City in Kyoto. It is the first time radioactive cesium has been detected from the manure made in Ibaraki. According to the Kyoto prefectural government, the manure is sold by a dealer in Tokyo and labeled "Horse Manure" (5 liters), made from horse manure and rice hay. The prefectural government instructed the store to remove the manure from the store premise and to recall the product voluntarily. There's no information as to how many bags of this manure have already been sold. Also, the prefectural government announced that 26,600 becquerels/kg of radioactive cesium was detected from the leaf compost made in Tochigi Prefecture and sold at "Cainz Home Kizugawa Branch" in Kizugawa City, Kyoto. Radioactive cesium has been detected in the Tochigi-made leaf compost in home/garden centers in Akita and Tottori Prefectures, but Kyoto's number is the largest so far. The dealer who manufactured and sold the radioactive horse manure is Sowa Recycle Corporation, headquartered in Tokyo. (The name of the dealer was in the press release by the Kyoto government.) On the company's website there is no mention of the manure found radioactive in Kyoto. One bright spot in this case of radioactive compost and manure that came to light in late July: It all started with a citizen in Saitama Prefecture who went in to the garden center nearby in June to measure the radiation on the surface of a bag of leaf compost. Power of an individual. She (I think it is she) had heard rumors that the radiation was high near the pile of leaf compost bags in the center, so she went there with a personal survey meter and a camera, and uploaded the video on Youtube. That was in late June. Then, more citizens went to garden centers in other prefectures to measure the radiation, and alerted the municipal governments. And the governments had to act. It looks like the survey meter on the robot (no info on whether it was Packbot or Quince) also went overscale. TEPCO announced on August 2 that the radiation level in the air conditioning room on the 2nd floor of the reactor building of Reactor 1 was over 5 sieverts/hr (or 5,000 millisieverts/hr). It is the highest indoor radiation ever recorded at the plant, higher than 4 sieverts/hr recorded also in the Reactor 1 reactor building on June 3. TEPCO closed off the room. 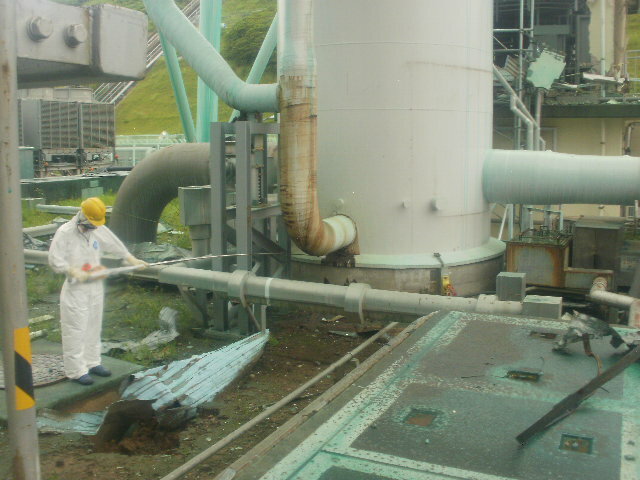 The vent duct that releases pressure inside the Containment vessel and the emergency gas processing pipe meet inside the room, which is upstream from the main exhaust stack where over 10 sieverts/hr radiation was measured on August 1. According to TEPCO, it is possible that the high concentration of radioactive materials got stuck inside the pipes when the venting was done on the next day after the March 11 earthquake. According to Yomiuri, 10 sieverts/hr radiation would be emitted from 2 grams of radioactive cesium. According to Kyodo News Japanese, the room is called the "train room" by TEPCO. I sure hope the room is located nowhere near where workers have to pass by, on their way to the upper floors to install the heat exchanger for the Spent Fuel Pool. Probably an ad by a subcontractor of a subcontractor of a subcontractor .... many degrees removed from TEPCO. So there are more than one spot. 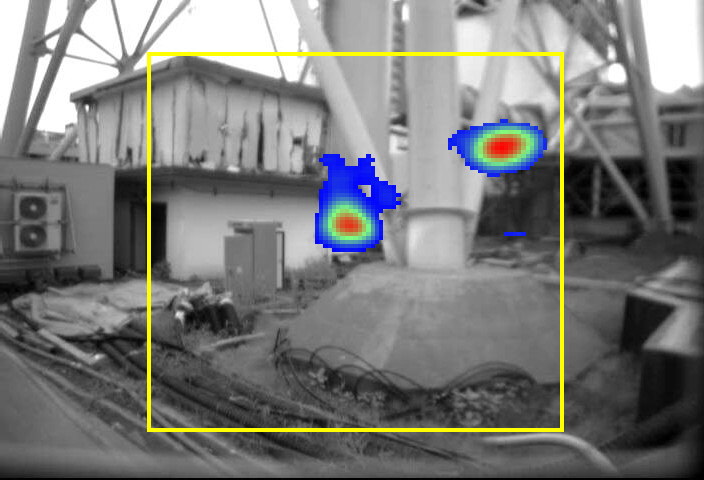 Then, the photo taken with a gamma-ray camera on July 31 shows two spots with high radiation. The lower left one is the one measured by the human worker in the first photo. Maybe it was not such a good idea to remove the debris. They may have shielded the workers from extreme radiation like these. They may not have known the exact number (well, for that matter, no one knows because the survey meter went overscale at 10 sieverts/hr), but they've been running past the area when they have to enter Reactor 1 building to install the external heat exchanger to the Spent Fuel Pool, according to the tweets by a worker currently at Fukushima I Nuclear Power Plant. So much for TEPCO's word that "there is no work planned near the area, and there will be no effect on the progress of the work at the plant", which is technically correct, at least the first half. There may not be any work planned in the area there, BECAUSE RADIATION IS TOO HIGH. There may be no work planned there, but the workers have to go near it to enter the Reactor 1 building. The radiation is so high that the workers, with all their full protection gear and equipment and construction materials they carry, have been running past the area in order to minimize radiation exposure. (Someone asked if it's true that TEPCO does not have the survey meter that can measure more than 10 sievert/hr radiation.) I think that's correct. We do have the instrument to measure the radiation of the nuclear fuel rods, but I wonder what happened to that. Broke? (Referring to the area where over 10 sievert/hr radiation has been detected,) the radiation level around the exhaust stacks has been too high to even go near, ever since the accident started. Not just the area around the stack for Reactors 1 and 2, but also the stack for Reactors 3 and 4. Debris are removed by shielded heavy equipment or remote-controlled equipment. That (10+ sievert/hr) spot was found during such operation. We have to run when we go by the stack to enter Reactor 1. That's hard work. My legs hurt already from climbing up and down the stairs in the reactor building. Now I appreciate elevators! All the elevators inside the reactor buildings at Fukushima I Nuke Plant are broken. As to the worker who measured the radiation with the survey meter attached to a stick, Hiroaki Koide of Kyoto University says he must have spent only 1 or 2 seconds near the stack to get 4 millisieverts radiation. Let's see. 2.78 millisieverts for one second, if the radiation was 10 sieverts/hr. Koide thinks the radiation level is impossibly high to be coming from inside the duct or stack. He suspects there is a piece or two of the spent fuel blown out of the Spent Fuel Pool when Reactor 1 and Reactor 3 had hydrogen explosions. He also says the protection suits that workers wear do nothing to protect them from gamma rays, unless they wear lead vests, but even then only marginally. Silver-110m, half life about 250 days, wouldn't have been discovered unless the control rods had melted at Fukushima I Nuclear Power Plant. There was the news in early April that radioactive silver was detected in South Korea. There was no way the same nuclide wasn't falling in Japan if it could fly all the way to Korea, I thought. It was not until 2PM on July 29 that the Ministry of Education and Science announced the "reading of environmental radioactivity level by prefecture [Fallout]" for March 2011. What's the point of telling us now? Just for the record? They look to be the nuclides coming out of melted fuel rods. No plutonium, strontium or uranium are mentioned. The level of radioactive iodine (131) and cesium (134, 137) is also markedly high in Kanto. It is particularly high in Tochigi and Ibaraki Prefectures, and it is higher in Tokyo than in Saitama or Chiba. The area with the elevated level of radioactive fallout includes Shizuoka and Nagano Prefectures. For details for other prefectures, please go to the Ministry of Education website. possibly irradiating children as they planted flowers as part of school curriculum. go to summer schools located in high radiation areas. Now the latest: they made them plant flowers using the leaf compost which turned out to be highly radioactive. As journalist Takashi Hirose said, they are "killing the children". The leaf compost that may contain high concentration of radioactive materials have been sold in the Prefecture. On July 31, it was discovered that one elementary school and one junior high school used the total of 40 bags (14 liters per bag) of the compost. According to the Prefecture's agricultural division, the schools used it in planters to grow flowers. The division says it has instructed the schools to move the planters away from school children. The schools contacted the Prefecture for advice on July 29. The names of the schools haven't been disclosed. The compost was sold at at Cainz Home's 14 stores in Nagano Prefecture. According to the agricultural division of the Prefecture, the elementary school purchased 10 bags in late June and mixed it with potting soil to grow chrysanthemums in planters. The junior high school used 30 to 40 bags to grow flowers. 14,800 becquerels/kg of radioactive cesium have been detected from this compost, as tested by Tottori Prefecture. According to Cainz, 13,000 bags of the same compost had been sold in Nagano since the March 11 earthquake until July 27, when the company voluntarily stopped selling. Concerning the radioactive leaf compost made in Tochigi Prefecture that was used in the schools' cultivation classes at 3 elementary schools in Kagawa Prefecture, one of the schools, Showa Elementary School in Ayagawa-cho (Principal Masanori Nakatsuka) held a meeting with the parents on July 31 night. The school listened to the parents and decided to discard the leaf compost. After the meeting, teachers and school administrators contacted all parents by email and phone calls. 35 parents attended the meeting, in which Principal Nakatsuka and Kazunori Sugimura, head of the town's Board of Education explained the situation. They said, "We want to apologize for having caused you much anxiety. If there is one parent who wants to have [the compost] discarded, we will." Then, the principal explained what the school's cultivation class was, and how the school became aware of the problem [of the radioactive compost]. He also reported that 400 planters that used the leaf compost had been moved to a location that morning and the school cordoned off the place. In Q&A session, parents said "We still worry even if you say there is no effect on health", and "It will be educational if we dispose it properly, and explain to our children at home and at school". The principal promised to dispose the leaf compost. The principle also said, "We will try our best to care for the psychological effect on children who have been growing chrysanthemum with great care. We will consult the prefectural government on the disposal." 179 pupils in 3rd to 6th grades planted chrysanthemums in the planters, using the compost. Shikoku Shinbun reports that the prefectural government received only 4 inquiries from the residents on July 31. Well, Mr. Nakatsuka, before you care for the psychological ill-effect, why don't you apologize to the pupils for having exposed them to physical ill-effect - radiation? But just like in beef, the testing will be done by sampling. We know how that ended, in case of radioactive beef. Or more like in vegetables, where they test one crop from one plot in one farm in one municipality, and if that passes the test, all farms in that municipality are good to ship. The harvest season in Chiba is about to start, in early August. The Chiba and Tochigi prefectural governments say they will test the rice harvested in their prefectures for radiation. The decision comes after radioactive cesium was detected in rice straw, vegetables and compost following the Fukushima nuclear accident. Farmers in Chiba and Tochigi planted rice seedlings in their fields after the accident and are voicing concerns over possible contamination due to fallout from the Fukushima plant. Officials in Chiba, where harvesting is expected to begin as early as August, say they will sample unmilled rice from one to several farms in each rice-growing municipality to measure radiation levels. They say they will not allow any farms in a municipality to ship their rice unless the tests show that the radiation readings of samples from the area are within the safety limit set by the central government. Tochigi authorities plan to have each area submit a sample for testing. They say they will also purchase 2 special devices to detect radioactive cesium, although they are still discussing the details of the testing method with the government. In Tochigi, rice harvesting will start in early September. The 2 prefectures are the first in Japan to announce that they will test rice for radioactive cesium. I am also a little worried about the rice currently in the market. It was harvested last fall, and is kept unmilled in warehouses until it's ready to be sold in the retail market. Remember the radioactive shiitake mushrooms that were grown indoors? The source of radioactive cesium in those mushrooms hasn't been identified, as far as I know. I sure hope it is not "air". SARRY uses the zeolite towers, like Kurion's system, to absorb cesium. TEPCO plans to use it after Kurion's and before AREVA's. Notice: We finished the installation of the second cesium absorption unit (SARRY), and will conduct a flow test from August 1 to 5. After that, we will seek approval from the government, we will conduct the test run. If there is no problem during the test run, we will start the full operation. Good luck, TEPCO and Toshiba. Takashi Hirose Who Has Pressed Criminal Charges Against Government, TEPCO: "We remain unaware, we just want to believe everything is OK"
Journalists Takashi Hirose and Shojiro Akashi announced at a press conference on July 15 that they had pressed criminal charges against 32 people including TEPCO management, Minister of Education, Culture, Sports, Science and Technology, and Fukushima's Radiation Health Risk Advisors including Shunichi Yamashita. biology, and Mr. Yoshiaki Takagi, Minister of Education, Culture, Sports, Science and Technology, and some other specialists in radiation. 15 people are charged with "death through negligence in the conduct of occupation", including Chairman Katsumata and Ex-President Shimizu from TEPCO, and Dr. Haruki Madarame, Nuclear Safety Commission Chief. Fish caught off Fukushima are being sold all over Japan as they are re-routed to ports far away from Fukushima, and people are eating them thinking they were caught in the safe (radiation-free) water. All part of the "safety myth" that the government has successfully created since the accident, and he says "we remain unaware, we just want to believe everything is OK, and live each day." Reality is too harsh, and betrayal by their own government is even harder to accept. Hirose: As you all know, the [Fukushima nuclear] accident started right after the earthquake hit on March 11. Then on March 20, one Shunichi Yamashita, of Nagasaki University, was installed as the radiation health risk management advisor. Right next day he started the campaign to preach "safety". Then in April, Kenji Kamiya of Hiroshima University and Noboru Takamura of Nagasaki University joined Yamashita as advisors. These three people have repeatedly said "It's safe up to 100 millisieverts", forcing children to be exposed to radiation. Now they are being criticized by citizens all over the country, but I want to make it clear that what they've done is criminal. I heard this story in Fukushima the other day. Informed parents tell their children, "Don't eat shiitake mushroom or bamboo shoot in the school lunch." So, the children take them aside. But then the teacher comes and orders them, "Eat!" Horrible, isn't it? This is what's happening now in Japan, you see. What are we going to do? Yamashita is behind this, isn't he? As someone said, this is happening because we have the Ministry of Education and Science. Why are we allowing this to happen? It's like killing our own children. I cannot allow it to happen. I think strontium is more dangerous than plutonium right now. Strontium should have existed inside the reactor in about the same amount as cesium. It is hardly detected, but that just means it hasn't been measured. I suspect the amount of strontium that has leaked into the ocean is enormous. So, under the current situation, I have no idea what is where. Talking about fish, as I discovered this time in Fukushima, fish [caught off the coast of Fukushima] are sold all over Japan. They are being re-routed to Kyushu, for example. People in the western Japan are eating these fish, thinking they are safe. Honestly speaking, I haven't a clue what's going on. I suspect we remain unaware, we just want to believe everything is OK, and live each day. That's the reality. That's how it goes.